Looking for a place to park downtown? There’s an app for that — coming in April. But it needs a name. 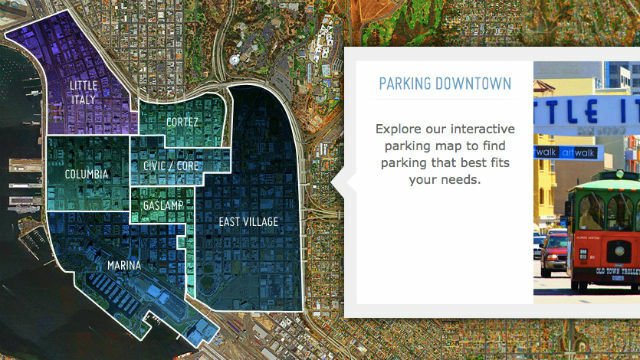 downtownsandiego.org has been helping with parking on its website. Civic San Diego and the Downtown San Diego Partnership announced Thursday that the public is invited to vote on a name for the new mobile app. The choices are ParkMateDTSD, parkDowntownSD, ParkIt!SD and TopSpotDTSD. In early returns, parkDowntownSD and ParkIt!SD were neck-and-neck. The app will initially provide off-street parking availability for 50 locations within downtown and real-time availability for two Civic San Diego-managed parking structures. “Civic San Diego is thrilled to be working with San Diegans to make parking in our vibrant downtown easier, and we are excited that they will have a hand in selecting the name,” said Reese Jarrett, president of the agency that handles development for the city. Kris Michell, president of the Downtown San Diego Partnership, said names mean a lot. “So we wanted to get the community involved to ensure we have a name that delivers on the promise of this new parking app — which is to make it easier to find parking and explore all downtown has to offer,” Michell said. The app will help drivers find the best parking options by searching location or price, and includes a function that will help visitors later locate their vehicle. The system will include opt-in alerts to users about downtown special events or street closures. It will be available for iPhone and Android devices. Votes will be taken until 8 a.m. Thursday, Feb. 26, on the partnership’s Facebook page at www.facebook.com/DowntownSanDiegoPartnership. The winning name will be announced when the app launches.